Frankincense, organic (Boswellia serrata) 5ml. 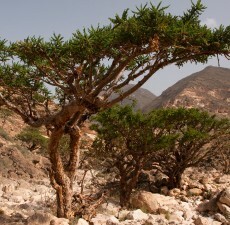 Product Abstract: Frankincense originates from a small scraggly but hardy tree indigenous to the Middle East, which is small with abundant pinnacle leaves and white or pale pink flowers. The resin begins as a fragrant sticky milky-white liquid that flows from the trunk of the tree when cut. The dried tears are collected, and the resin is then distilled, producing the precious oil. The resin is known as olibanum, derived from the Arabic al-luban or 'that which results from milking', referring to the milky sap. It is used as incense, and has been traded for 5,000 years. Widely used in ancient Egypt, it was one of the ingredients used in the holy oil described in the Talmud. Frankincense was brought back to Europe by Frankish Crusaders (Frank-incense), and the oil is still highly prized today in the perfumery industry, and widely used in the manufacturing of skin-care products.